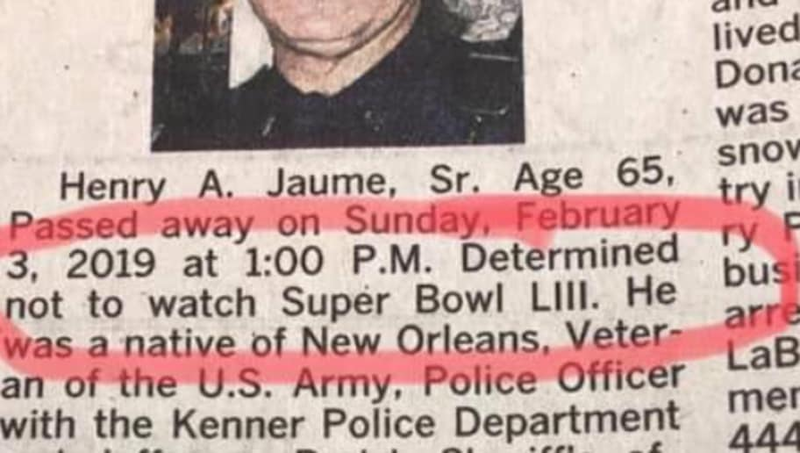 ​​In his obituary, his family decided to add a light-hearted joke, saying he passed early Sunday because he was "determined not to watch" this year's Super Bowl. Many other fans took action following the no call. In fact, one Saints fan bought several billboards all over Atlanta and plastered the message "NFL BLEAUX IT," among other takedowns, throughout the city. The New Orleans Advocate reported that two Saints season-ticket holders are going to the extreme by taking legal action concerning the no call by suing NFL Commissioner Roger Goodell and the league for damages, including: mental anguish, emotional trauma, "loss of enjoyment of life" and "distrust of the game which has become the national pastime." Overall, ultimately it is very unfortunate that Jaume has passed with such timing, but his family found a funny way of honoring his love for the Saints, and the entire city's remaining distaste after the historic non-call.